The ethnic groups in Gilgit-Baltistan have been utilizing local resources in their centuries-old traditional healing system. Most tribes within these ethnic groups still rely on traditional healing systems. We aim to understand the current status, uses, and abundance of medicinal plants, associated traditional knowledge, and trade. The study incorporated over 300 local community members (70% men and 30% women) in focused group discussions, semi-structured interviews, and homework assignments for 8th to 12th grade students to document traditional knowledge (TK) in six districts in Northeast Pakistan. We calculated various indices such as informant consensus factor, use value, relative frequency of citation, and CoKriging. These indices, along with repetitively used medicinal plants, were used to analyze differences in studied locations. Most of the community members still rely on traditional medication in the study areas. However, we found the highest number of medicinal plants used in Skardu and Gilgit compared to other districts and these two districts also represent trade centers and a highly populated area regarding medicinal plants. Results indicate connection amongst the surveyed villages signifying mixing of knowledge from different sources, with certain areas more influenced by traditional Chinese medicine and others more by Ayurveda and Unani. TK is mostly retained with elder community members; however, those directly linked with market value chain retain rich knowledge on traditional use of the medicinal plants from the region. Major trade centers in the region also coincide with a high density of medicinal plant occurrence, knowledge, and higher utilization. Therefore, with the increasing trade in medicinal plant in the region, there is potential for rejuvenation of this knowledge and of plant use in the region. Gilgit-Baltistan, the northeast mountainous region of Pakistan, is outstanding for its rich ethnic diversity [1–3]. This region is situated in a strategic geographical location that is important as a part of the ancient silk route and its position along the China-Pakistan Economic Corridor [3–5]. For centuries, knowledge exchange has occurred between indigenous dwellers and migrants and peddlers from the southern, northern, and western parts of Asia. Besides, the region is one of the important plant areas in the Himalaya, Karakoram, and Hindukush (HKH) landscape [6–12]. In the epoch of Anthropocene, as for other parts of the world, this region also experienced problems due to human population growth and associated land use transformation that severely affected both important species and the wider ecosystem [13–15]. Still natural resources, especially plant diversity, are very significant for ethnic communities in this mountainous landscape [10, 14, 16, 17]. Plants are the source of energy and food, a building material for houses, and a main component of the health care system as folklore medicine [18–27]. There are about 600 species of flowering plants in Pakistan that are utilized as medicinal plants and around 500 of these have global significance and studies available [9, 16, 28]. Around 50,000 traditional healers and informal Pansaris (retailers) are registered in Pakistan who frequently utilize and sell 400–600 plants species for their medicinal, cultural, traditional, and spiritual benefits [29–31]. Gilgit-Baltistan, with above 300 reported species of MAPs, is a hotspot for medicinal plants and their utilization in Pakistan [9, 12–14, 16, 27, 30, 32–41]. With seven districts and an ideal mountainous landscape, this region is naturally suitable for high-value medicinal plants. The local communities have been utilizing this resource for many generations [9, 12, 15, 33, 36, 42–45]. Several researchers have previously documented traditionally used medicinal plant from different districts in this region. Shedayi and Gulshan (2012) and Shedayi et al. (2014) in Ghizer district; Khan et al. (2013) and Akhtar et al. (2016) in Hunza; Bano et al. (2014) in Skardu; Khan and Khatoon (2007) and Fahad and Bano (2012) in Gilgit; Abbas et al. (2016) in Baltistan and the contributions of Hussain et al. (2011), Khan et al. (2011), Qureshi et al. (2006), and Ali et al. (2017) are important and noteworthy for the documentation of plant species used locally for medicinal purposes besides reporting on the modes of their uses and diseases targeted/cured through traditional herbal practitioners. In addition to the utilization of medicinal plants in the traditional healing system, trade in herbal raw material and product is not new in the area. As this region serves as an ancient trade route that connects south Asia with China, Central Asia, and West Asia; trade in medicinal plants and exchange of traditional healing knowledge is very likely. For instance, archeological studies reveal the influence of cultural incursions from the Indian subcontinent, China, Scythia (Eurasia), Transoxiana (Uzbekistan, Tajikistan, southern Kyrgyzstan, and southwest Kazakhstan), and Ancient Greece, amongst others on traditional medicinal system [3, 46]. Before the introduction of Islam, the communities in Gilgit-Baltistan were predominantly practicing Buddhism [3, 46–50]. The region is recognized for its contributions towards survival and expansion of Ayurveda during the British regime . Hakim Ajmal Khan is a famous Indian physician who worked for the revival of Ayurveda and Unani systems during the British era by establishing an Ayurveda and Unani medical college and a pharmaceutical company besides continuing with his own clinical practice of the systems . Before the region completely came under Dogra Raj of the Kashmir State, Hunza, Gilgit, Nagar, and Ghizer mainly remained under Chinese influence, whereas Skardu, Astore, Ghanche, and Diamer remained under Tibetan influence [3, 46]. Recently, with development of the Karakoram Highway (KKH) and China-Pakistan Economic Corridor (CPEC) that follow the ancient Silk Routes [3, 50] in the region, this area has become important junction of trade. 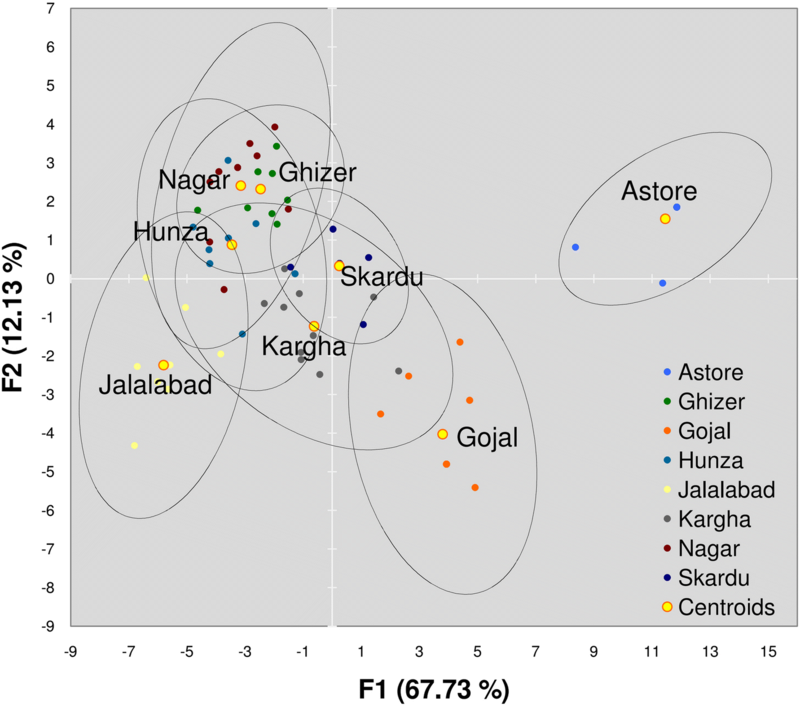 Our research provides the first comparative study for six districts of Gilgit-Baltistan where the influence of Chinese, Ayurveda, Unani, and Tibetan healing systems on folk knowledge has been observed. Traditional knowledge of medicinal plants is often socially integrated through communal learning and intercultural exchange. Medicinal plants in mountainous terrain are known for their distribution in elevation corridors or endemism to a particular locality. We therefore aim to explore the richness of traditional knowledge of medicinal plants, their uses, distribution, and trade in the mountainous region of Gilgit-Baltistan, learn about the knowledge exchange between the old and young generation as well as amongst different communities and localities of the region, and how medicinal systems like Chinese, Ayurveda, Tibetan, and Unani influenced the use of traditional medicine system in the region. We also explore the possible factors behind the general decline in knowledge about medicinal plants, yet the continued use of traditional medicine for treatment of different diseases and how the current markets and market players supplement this phenomenon. We take an inventory of these plants, their use value, and local importance at a regional level and current markets. We also look at how these factors and the influence of different medicinal systems in the region compliment the transfer of knowledge to younger generations and across different ethnicities and locations in the region. Gilgit-Baltistan is located in the far north of Pakistan, with Afghanistan to the north and west, China to the north and east, and India to the south . The seven districts are spread over an area of 72,496 km2. The region is rugged and mountainous, located amongst three of the highest mountain ranges—the Himalayas, the Karakoram, and the Hindukush (HKH) and home to the largest number of glaciers outside the polar region [36, 53, 54]. The study was focused on Gilgit, Hunza, Nagar, Ghizer, Skardu, and Astore Districts of Gilgit-Baltistan. The residents are divided into sub-groups based on their origin as well as their ethno-linguistic clustering (Fig. 1). Yashkun, Sheen/Shinaki, Wakhi (those who migrated from Wakhan), Burushos, Dom, Brokpa, and Balti are the main tribes of the area; some Kashmiris, Kohistani, Mongols, Mughals, Rajas, Pathans, Gujar, Soniwal, Mon, Hor, and Kashgari also reside here [35, 55–60]. The majority of Gilgit-Baltistan is sparsely populated with these tribes, but Ghizer is dominated by Burushos; Gilgit, Hunza, and Nagar have Burushos, Sheen, and Yashkun; Diamer and Astore are majorly populated by Sheen, Yashkun, and Kohistani communities; and Skardu and Ghanche are predominantly Mon, Hor, and Mongols [60, 61]. The languages spoken by Burushos, Sheen, and Yashkun are Shina, Burushaski, Wakhi, and Khowar (only Ghizer and parts of Hunza) while the Mongols, Mon, and Hor speak Balti [9, 38, 60, 62]. 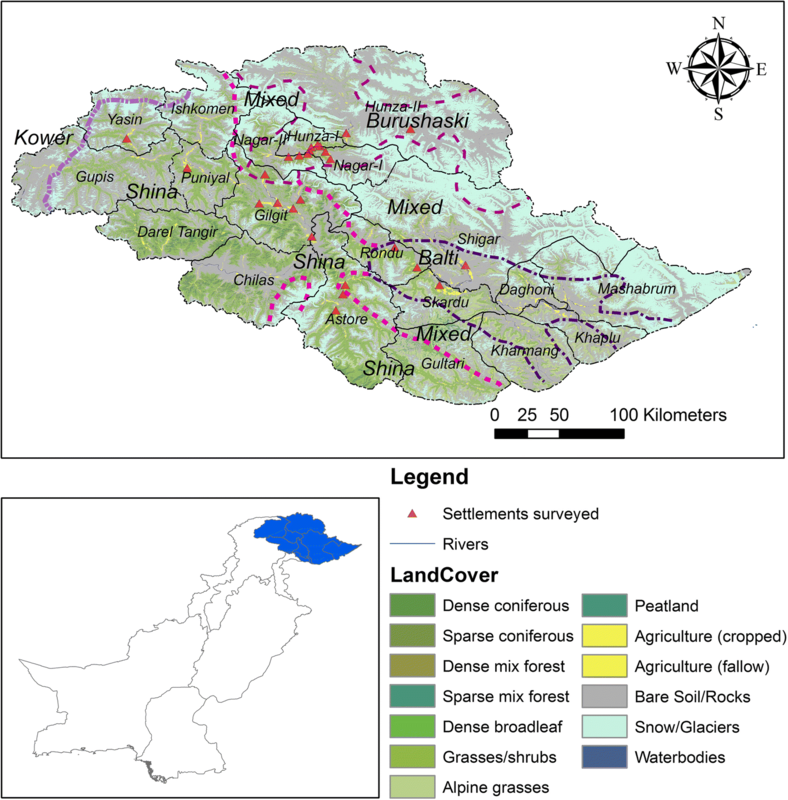 Communities in Gilgit-Baltistan are dependent on agricultural resources and live close to the forest area (Fig. 1). Land cover changes, lack of resource management and sustainable harvesting policies, and political interests at massive scale in the HKH and Pamir mountain ranges have severe and long-lasting impacts on the region [63–66]. Medicinal plants and traditional medication have been used for generations for curing different diseases [34, 36, 63, 67]. Since opening of KKH in 1982 , markets for local products started to develop, thus exerting pressure on natural resources [33, 68]. The study was carried out from January 2017 to May 2018, during which 300+ local community members were approached via focused group discussions (FGDs), semi-structured interviews, and homework assignments for 8th to 12th Grade school and college students. The participants included men and women community members, local traditional health practitioners (THPs), community elders, and wholesalers and retailers of medicinal plants. Following the snowball sampling methodology [69–74], a total of 15 FGDs and 240 individual interviews were conducted for data collection. Sixty students were provided with a set of questionnaires to reach their families and understand what kind of plants/herbal remedies are used in the families and how traditional knowledge is preserved within a family. This method was tested in Nepal and was quite effective to document traditional knowledge . Prior permission and consent for data collection and publication was obtained from all the participants. The homework assignments for school students were administered under the supervision of concerned class teachers. Data on age and gender was also acquired from the participants. These methods resulted in data covering an ethnobotanical inventory of plants, part used, therapeutic utilities, the location and timing of acquiring the resource, and the existing markets with trade opportunities. The initial taxonomic identification of medicinal plants was done by a taxonomist in the field [76–78] and by cross-referencing photographs, voucher specimens, and the local name of species with previously available material and literature from the study area [9, 35, 41, 79, 80]. Information on local names of plant species, and parts of the plant utilized for different medicinal purposes was recorded. Collected specimens were mounted on herbarium sheets and identified by the taxonomists in the Karakoram International University. The voucher specimens were authenticated through the plant list (www.theplantlist.org), tropicos (www.tropicos.org), and flora of Pakistan (www.efloras.org) and deposited in the herbarium of the Karakoram International University. We regressed age of participants against the number of species reported by respective age group and people engaged in the trade of medicinal plants during the survey to understand TK in the region. We used CoKriging method  to interpolate the number of species recorded and used in various medical conditions from the surveyed locations to recognize section of highest medicinal plant use in the region. Kriging is an advanced geostatistical procedure that generates an estimated surface from a scattered set of points with z values. CoKriging is multivariate extension of Kriging method that uses information from one or more correlated variables measured in the same range. This method is useful in mountainous areas with rugged terrain. This method has been tested and used in tree richness mapping, abundance mapping, and recognizing areas at high risk of species invasion [81–83]. where Nur indicates the number of use reports for a specific disease category and Nt mentions the number of taxa used for the disease category. where∑Ui is the total number of use reports for a given species and N is the total number of participants inquired for the species. where FC is the number of participants reporting on the use of a plant species and N is the total number of participants in the survey. We used discriminant analysis to delimit the geographical differences of the ethnobotanical knowledge using quantitative measures (viz. UV and RCF), highly used species, and number of treatments. Discriminant function analysis or discriminate analysis (DA) determines naturally occurring groups and the variables responsible for segregating amongst them [91–93]. More than 300 participants including 70% men and 30% women were interviewed during the survey (Fig. 2). The Yashkun, Sheen/Shinaki, Burushos, Wakhi, and Balti communities approached during the survey possessed good knowledge on medicinal plants use. Although these tribes maintain individual identities representing different parts of the mountainous region, the cross-cultural interactions have led to the growth and diversification of the traditional knowledge. The results from FGDs, HH, and market surveys revealed that regardless of ethnicity, THPs and retailers retain a significant level of information on the medicinal plants of the region, the locations from where the plants can be acquired and the ailments they can be utilized for. Although the participants from the community and THPs provided more extensive information than the retailers, when it came to the question of how to use a certain plant as medicine, the retailers had ample information to share on a higher number of medicinal plants and their general uses (Fig. 3 Fig. 4a). We found that participants above 50 years of age had significant traditional knowledge regarding utilization of medicinal plants. This was evident from the number of species and their uses reported per interview where a higher number of species was reported by participants above 50 years of age. Our results from the linear regression (R2 = 0.65; p < 0.0001) also revealed that number of species reported increase with age of the participant (Fig. 4b). The students responding to homework assignments mostly brought information from women representatives of the household, thus providing relevant information on which plant species are kept at home and used for treating common sicknesses. We documented a total of 231 species representing 141 genera and 61 families (Table 2). Compositae was the most dominant family with 30 (12.9%) species reported, followed by Leguminosae, Lamiacceae, Rosaceae, Polygonaceae, Ranunculaceae, Salicaceae, Apiaceae, and Berberidaceae, with 16 (6.9%), 15 (6.5%), 15 (6.5%), 14 (6.1), 10 (4.3%), 10 (4.3%), 9 (3.9%), and 9 (3.9%) species, respectively. In total, 208 diseases were treated with documented species. 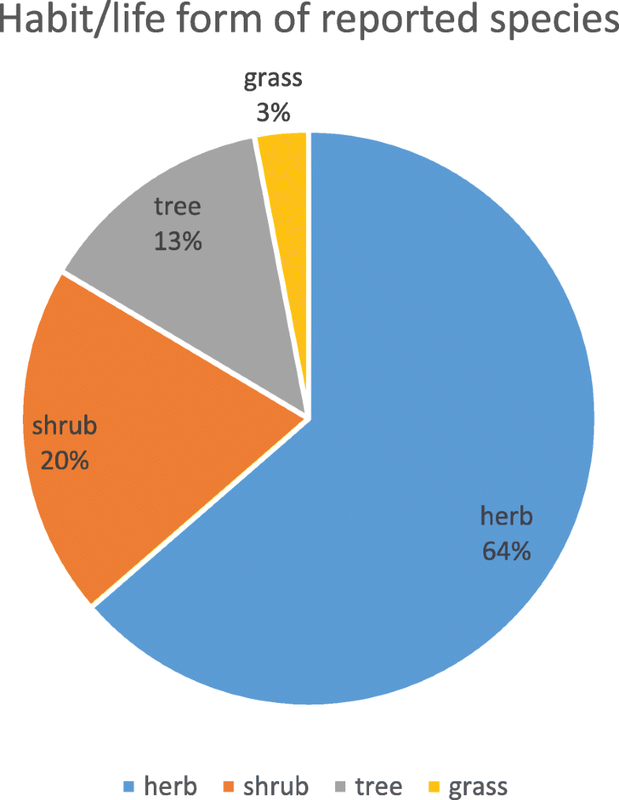 The herbaceous flora accounts for 64% of the total reported species followed by shrubs at 20%, trees at 13%, and grasses at 3% (Fig. 5). 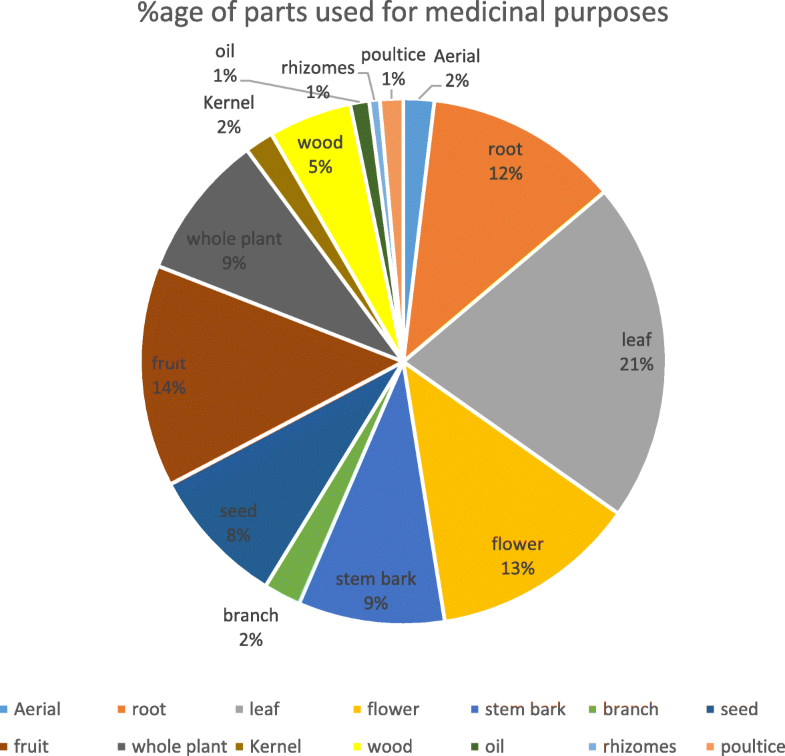 Figure 6 represents the percentages of uses of different parts of the medicinal plants (further detail is available in Additional files 1, 2, 3, 4, 5, 6, 7, 8, 9, 10, 11, and 12 where a comprehensive list of species is provided besides the district level analysis). During the survey, the participants revealed that medicinal plants are acquired from special locations and at a specific time, i.e., during a FGD in Upper Hunza (Gojal), the participants mentioned that medicinal plants are found both at the village and in pastures, yet the plants from pastures are used for medicinal purposes as those found in villages are not considered effective for medication. This needs to be scientifically verified from the field area, yet cases of same plant species presenting different chemical traits has been a known fact [94, 95]. Interpolated results revealed that the utilization as well as high occurrence of medicinal plants is mainly concentrated in two locations (Fig. 7). Valleys from Skardu, Gilgit, and Ghizer are reported for the highest number of medicinal plants and their uses. There are no formal markets for medicinal plants in the region . Gilgit and Skardu being the main business hubs serve as main markets for wholesale, retail, and purchase of medicinal plants. Besides, small amounts of the medicinal plants are supplied to bigger markets in Rawalpindi and Lahore by the wholesalers. The market players reported Skardu, Astore, and Gilgit districts as the main suppliers of medicinal plants as well. Participants from the market revealed that most of the large herbal medicine production companies in Pakistan rely on raw materials from Indian Territory representing the same region across the border. Although a clear percentage of product flow was not known, during the market survey, the participants mentioned that the current markets for locally available plants are limited to the small town market centers and partly target markets in big cities like Rawalpindi (10%) and Lahore (10%) with meager shares moving out across the border to China (1–2%). The participants emphasized the involvement of government agencies for sustainable promotion, collection, and utilization of diverse plant resources in the region. According to the retailers in Gilgit-Baltistan, Thymus linearis, Delphinium brunonianum, Bergenia stracheyi, Saussurea heteromalla, Saussurea lappa, Carthamus tinctorius, Peganum harmala, Rheum emodi, Mentha longifolia, Mentha arvensis, Valeriana wallichii, Berberis lyceum, and Elaeagnus rhamnoides account for the most demanded and utilized species. Although most of the customers were aware of the uses, the retailers had significant knowledge of the plant species they sold. Our survey results revealed that there is a large group of locals in Gilgit-Baltistan who rely on traditional medicine, yet these practices and the knowledge associated with them is rapidly depleting from the region. All the participants included in the survey had used medicinal plants for treating a medical condition at least once in their life. 79.5% of participants reported a transfer of knowledge from family elders. Out of these, 48% were above 50 years, 38% above 40 years while only 13% were below 40 years of age. 29.1% reported learning from community elders, of whom 64% were above 50 years, 32% above 40 years and only 3% below 40 years. 15.6% reported that they had acquired knowledge through interaction with other people, including THPs, plant collectors, and traders from other communities that include 87% above 50 years and 13% above 40 years. 20.1% were not aware of any treatments through medicinal plants which included only 4 and 26% participants above 50 and 40 years of age respectively while 70% of these participants fell below 40 years of age. Our results clearly indicate that the main source of knowledge transfer rests within the family. Yet only 13% of participants below the age of 40 confirmed that they had received such knowledge from within the family. Traditional healers in the community are experts in recognizing and collecting medicinal plants while other community members are not fully aware of the exact timing for collection. This is one of the main reasons why knowledge transfer is mainly through family elders as family secrets are not shared with outsiders. This allows the family to practice special medicinal remedies as well as retain a good image as regular suppliers to the wholesalers, retailers, and THPs in the region. The gradual expansion of trade and an increasing demand for medicinal plants in and outside the region has a positive impact on knowledge sharing. Most of the suppliers involved in the supply chain of medicinal plants represent the age group 40–60 which raises great concern for the future. Those representing the younger age group are either not collecting proper plants at the proper time or are too keen on gaining more financial benefits, thus not taking long-term conservation into account while collecting. This ever increasing gap between the young and old generation is affecting the knowledge transfer mechanism, in combination with over-exploitation and lack of conservation strategies, and the impacts of climatic changes. Such issues have also been observed in other studies [9, 30, 34, 42]. The ICF analysis was done separately for each location in order to assess a clearer picture on which diseases stand out at each location and how many plant species are utilized for their treatment. Table 1 includes the ICF values for diseases divided into 29 disease categories from each of the study locations. The table indicates that stomach and intestinal disorders, respiratory disorders, skin infections, internal and external wounds, pain relief, ear, nose and throat disorders, hepatitis, and livestock diseases were the top disease categories reported from all the field sites during the field study. Most of the ailment categories were reported with a high ICF value based on the number of species and their usage reports. This is an indication of homogeneity in responses of the participants from each of the study sites in terms of the medicinal plant species and the modes of their use for addressing a particular disease. The results from ICF values clearly indicate that diseases related to stomach and intestinal disorders; respiratory disorders especially asthma; skin infections; and ear, nose, and throat infections were most common diseases, which is also supported by various publications [13, 18, 41]. Besides, the communities generally rely on medicinal plants for treating different kinds of internal and external wounds [10, 13, 18, 39, 41]. It is also evident that community members owning livestock hugely depend on traditional mode of medication . The RFC and UV values for each plant species were calculated in order to validate the frequency of citation for the species used for different ailment categories. The values were calculated at district level in order to authenticate the local frequency of use. The RFC value is used for verifying the use of a medicinal plant species for different diseases while the UV value is an indication for the relative importance of these species in a particular population . The highest RFC value from all the sites was calculated for Dracocephalum nuristanicum Rech.f. & Edelb. (0.7) followed by Cupressus sempervirens L., Prunella vulgaris L., and Potentilla argyrophylla Wall. ex Lehm., averaged at 0.47 each indicating that these species were highly reported by the participants of the study. RFC directly depends on the number of participants mentioning use of a particular plant (FC); therefore, the abovementioned plants were very commonly used in the study area. The UV values for Amaranthus viridis L. (0.33), Artemisia herba-alba Asso (0.28) and Astragalus zanskarensis Bunge (0.25), and Aconitum violaceum Jacquem. Ex. Stapf (0.25) were the highest averaged from the field sites. The results indicate the usage and reliance on medicinal plants for treatment of multiple diseases. Such reliance on medicinal plants in both humans and livestock are reported from the region [9, 16, 18, 30, 34, 38, 41]. Table 2 includes a list of reported species from all the six districts of Gilgit-Baltistan with their local names, parts used, mode of their utilization, the average values for RFC and UV, number of ailment categories addressed, and the number of uses reported for each of the plant species. Area wise details for each of these species is provided in Additional files 2, 3, 4, 5, 6, 7, 8, and 9 while the detailed list of diseases categorized in 29 ailment categories is provided in S12. Pistacia mutica Fisch. & C.A.Mey. Pleurospermum candollei (DC.) C.B. Clarke in Hook. f.
Berberis orthobotrys Bien. ex Aitch. Artemisia santolinifolia Turcz. Ex Krasch. Tanacetum senecionis (Jacquem. ex Besser) J.Gay ex DC. Dracocephalum nuristanicum Rech.f. & Edelb. Nepeta leucolaena Benth. ex Hook.f. Comarum salesovianum (Stephan) Asch. & Graebn. Potentilla eriocarpa Wall. ex Lehm. Viola serpens Wall. ex Ging. This region has already witnessed invasion by different cultures and practices [3, 46–51]. The passes created by the Indus River system in Hunza, Shigar, Shyjok, Ghizer, Gilgit, and Astore valleys served as the main travel routes for such invasions and exchanges as Gilgit got its famous name “gate to India” . This region witnessed influence from Chinese, Tibetan, ancient Indian, and Unani systems [3, 46]. This influence was reflected during the field survey while recording the uses and modes of use of medicinal plants. Fifty percent of the participants were able to answer the question related to influence of medicinal systems on the indigenous knowledge existing in the region; where 28% referred to Chinese influence, 23% chose Indian subcontinent while 18 and 14% selected Scythian/Transoxianan, and ancient Greek influence on the traditional medicinal system. It is worth mentioning that 41% of these participants referred to a mix of at least two of these systems in the current traditional medicinal system. Most of the participants from Astore and Skardu mentioned Indian subcontinent followed by Scythian/Transoxianan and ancient Greek influence while participants from Hunza, Nagar, Gilgit, and Ghizer ranked Chinese influence on top followed by Indian subcontinent, Scythian/Transoxianan, and ancient Greek. The market players on the other hand opted for a mix of all these systems together as they deal with customers from the whole region and are exposed to all medicinal systems prevailing in the region. Another reason for a mixed system described by the market players is the fact that these markets were traditionally placed at regional centers, thus were exposed to THPs representing different systems. Their experiences with these THPs and fulfilling their demands made them acquire traits from all the systems. Although a clear boundary could not be drawn between these systems, it is likely that medicinal practices in Hunza, Nagar, Ghizer, and Gilgit were influenced by traditional Chinese medicine (TCM) system while the remaining part of study area was dominated by a mix of Ayurveda and Unani systems. 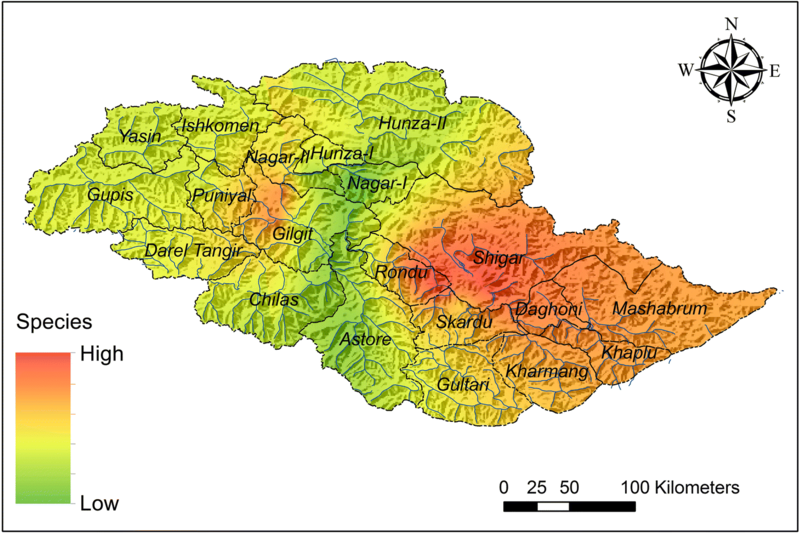 Discriminant analysis revealed that Astore was distinct from other surveyed areas whereas some overlap can be observed in other surveyed areas (Fig. 8). Gojal showed similarity with Skardu and Kargha, while Jalalabad showed few similarities with Kargha and Hunza. Hunza, Nagar, and Ghizer showed very similar traits while sharing few similarities with Skardu, Kargha, and Jalalabad. This analysis mainly considered top 10 medicinal plants used and the parameters calculated from each location. This does not represent linkage with healing systems but separates geographical location, tribal representation, and connectivity to other parts of the region, e.g., China, India, and routes to Western Asia. It also reflects on migration and integration of the local tribes as well as those coming from outside and provides an insight on the influence of different invaders, travelers, and businessmen. Plant species have responded to latitudinal and elevational changes in their habitat and adjusted over time, yet the increasingly rapid pace of these changes is challenging their adaptability and ability to respond [96–98]. The association of traditional knowledge with these species, trade potentials, and transfer of knowledge from old to new generation will have a direct effect on the conservation of plant species and associated TK [90, 99–103]. The environment and climatic conditions of Gilgit-Baltistan make it geographically one of the best locations for growth and nourishment of medicinal plants [6, 9, 34, 104]. Traditional medicinal practices hold a significant place in the lives of the local communities. The markets at Gilgit and Skardu are serving as trade centers for medicinal plants from the whole region, and the wholesalers stationed here are responsible for small-scale trade in important plant species in both local and national markets. The study shows that most of the large herbal medicine production companies in Pakistan rely on supply of medicinal plants from Indian territory—representing the same region across the border—indicating that the production and trade of medicinal plants is well organized across the border. The trade of medicinal plants in Pakistan is informal, with little to none state interventions and incentives [35, 105]. The high marketability of medicinal plants has led many local people to over-exploit this valuable resource. Over-exploitation of medicinal plant species is widespread across the region, exacerbated by some local people attempting to maximize financial benefits in a single harvest, with little concern for the ramifications for subsequent years [9, 30, 34, 42]. This study clearly reveals the importance and contributions of the THPs and retailers as well as the transfer of knowledge within the families from elders to the younger generation for the retention of indigenous medicinal knowledge, where and when to acquire a particular species and the utilization of medicinal plants. The THPs preserved existing knowledge and showed a great deal of openness to knowledge sharing. They attributed the loss of knowledge between generations, not to any failure of their own to impart knowledge, but rather to a lack of learning aptitude in the younger generation [34, 106]. Retailers have adapted well to the demands of different ethnic and tribal groups. These factors point towards a high level of cooperation, collaboration, and openness to knowledge exchange amongst the ethnicities and tribes of Gilgit-Baltistan. Local public and private institutes can therefore play a vital role in clustering the knowledge and bridging the gaps by providing platforms for recording, sharing, and disseminating traditional knowledge. We found that Gilgit-Baltistan’s position as a gateway between the Central and South Asia caused its exposure to a number of traditional medicinal systems including the Ayurveda, traditional Chinese medicine, Unani, and Tibetan—which highly influenced traditional medicine knowledge in this region [3, 46]. Our study design and timeline restricted us from further exploration of these historical details. Therefore, we were not able to explore the timeline and actual contributions of these systems to local knowledge. However, it appears likely that medicinal practices in Hunza, Nagar, Ghizer, and Gilgit were influenced by traditional Chinese medicine (TCM) system while the remaining part of the study area was dominated by a mix of Ayurveda and Unani systems. This is an interesting finding and deserves further research. Most parts of Pakistan are primarily relying on a mix of Unani and Ayurveda medicinal systems—a combination which is rarely found elsewhere . A dedicated study exploring the approaches followed by these medicinal systems, their complementarities, and differences could lead to the generation of highly valuable scientific findings that could contribute to the communities relying on these systems globally. With the involvement of multiple stakeholders (the relevant local government departments, herbal medicine-producing companies, THPs, and the interest of the national government), medicinal plants and associated traditional knowledge from Gilgit-Baltistan can make a substantial contribution to traditional health practices at a national level as well as contribute significantly to the national market and the livelihood resources of local communities. Proper licensing will allow the THPs to legally practice, document, and disseminate their knowledge. The concerned government departments can provide a platform for THPs from the region to get registered and licensed as hakims . Our effort to involve school students in the collection of data is a way of exposing the younger generation to identification of their resources and developing their interest in traditional knowledge and why it is important to ensure its transfer to them from the older generation. Such a consortium will also prove beneficial for the production of medicinal plants on a commercial scale, their sustainable utilization, and organizing refreshers on different aspects associated with medicinal plant resources for the local THPs, retailers, and collectors in order to ensure an optimal and efficient utilization of the available resources. These points are of utmost importance when it comes to the conservation and transfer of traditional medicinal knowledge to future generations. Worldwide, patients are increasingly opting for medications involving traditional techniques, herbal medicine, and meditation [108, 109]. Gilgit-Baltistan has natural medicinal resources, a vast indigenous knowledge bank, and most importantly one of the best mountainous landscapes for tourism and meditation. It is doubtless the best option to be considered for developing into a sanctuary through government interventions. Gilgit-Baltistan, considered to be home to the ideology of “SHANGRI LA” with its abundant natural resources, can provide a home to those who seek medication through centuries-old traditional knowledge, sacredly transferred from one generation to another. The diverse plant resources and the geographical importance of the region for trade and travel routes, historically made Gilgit-Baltistan a hotspot for cultural, religious, and traditional knowledge exchange. Being part of an ancient trade route, the resident communities adapted and upgraded their traditional healing systems through interactions with the Indian subcontinent, China, Scythia, Transoxiana, and Ancient Greece. This influence and amalgamation of Chinese, Ayurveda, Unani, and Tibetan medicinal systems is apparent in local traditional knowledge. Our study revealed that most of the local people still rely on indigenous healing practices. Higher knowledge and use of medicinal plants is retained in the areas that also serve as main trade centers in the region. The trade of medicinal plants in the region is the one key factor in retaining traditional knowledge on medicinal plant utilization. This continued reliance on medicinal plants shows the significance of these traditional practices. A thorough evaluation is needed by ethno-pharmacologists and other concerned institutions working for public health and hygiene, especially focusing on THPs, market actors and old folk from the region. For strategies to be devised for market exploration, raising awareness, and continuity of TK, involvement is required from Government institutions, research organizations, NGOs, donors, and the private sector. We are thankful to the participants of the field survey for their cooperation and time. The Law Enforcement Agencies at Gilgit-Baltistan especially Captain Faisal Anwar, Captain Muhammad Awais Salim, and their entire team are thanked for their support and provision of services in times of need. The study was conducted under the “Investigating and recalibrating traditional ecological calendars and climate change adaptation in the Himalaya region” funded by Bureau of International Cooperation Chinese Academy of Sciences, Grant No. 151853KYSB20160032. Additional support was provided by the National Natural Science Foundation of China, Grant No. 41661144001. Funds acquired from these sources were utilized for field visits, collecting, and analyzing data and interpretation of results. In addition to the data presented through tables and figures in the main text, all the data supporting the findings and results is available in the additional files provided with the manuscript. MAS, SR, and JX conceptualized, planned, and designed the study. MAS and TK led the data collection team of SA, CK, AP, ZB, and SB. MAS and SR analyzed the data, wrote, and finalized the manuscript. RH and JX revised the paper. SR and JX supervised the first author during his doctoral research. All the authors have read and approved the final manuscript prior to submission. The study is based on field surveys, and no human or animal trials were involved or conducted. Formal consent was obtained from participants prior to data collection and publication. In addition, International Society of Ethnobiology (ISE) code of ethics http://www.ethnobiology.net were strictly followed while conducting the research. Formal consent was obtained from participants prior to data collection and publication. Biddulph J. Tribes of the Hindoo Koosh. Graz: Akademische Druck- u. Verlagsanstalt; 1971. Available from: file: https://catalog.hathitrust.org/Record/100159287. Khan SW, Abbas Q, ul Hassan SN, Khan H, Hussain A. Medicinal Plants of Turmic Valley (Central Karakoram National Park), Gilgit-Baltistan, Pakistan. J Bioresour Manag. 2015;2 Available from: http://corescholar.libraries.wright.edu/jbm. Indigenous peoples and climate change. In: Salick J, Byg A, editors. Indig. Peoples Clim. Chang. Oxford: Tyndall Centre for Climate Change Research, 2007. Available from: http://ir.lib.uwo.ca/iipj/vol1/iss1/2. Khan T, Khan IA, Rehman A, Alam J, Ali S. Exploration of near-extinct folk wisdom on medicinally important plants from Shinaki Valley Hunza, Pakistan. Int J Biosci. 2013;3:180–6. Available from: https://www.cabdirect.org/cabdirect/abstract/20133395619. Holdnack JA, Millis S, Larrabee GJ, Iverson GL. Assessing performance validity with the ACS. In: Holdnack JA, Drozdick LW, Weiss LG, Iverson GL, editors. WAIS-IV, WMS-IV, ACS Adv Clin Interpret: Elsevier Inc.; 2013. p. 331–65. https://doi.org/10.1016/B978-0-12-386934-0.00007-9. Ingty T, Bawa KS. Climate change and indigenous people. In: Arrawatia ML, Tambe S, editors. Clim Chang Sikk Patterns, Impacts Initiat: Information and Public Relations Department, Government of Sikkim; 2012. p. 424. Available from: http://www.sikkimforest.gov.in/climate-change-in-sikkim/17-Chapter_ClimateChange and Indigenous people.pdf. Angmo K, Adhikari BS, Rawat GS. Changing aspects of traditional healthcare system in Western Ladakh, India. J Ethnopharmacol 2012;143:621–630. Available from: https://doi.org/10.1016/j.jep.2012.07.017. Elsevier. Mukherjee PK, Harwansh RK, Bahadur S, Banerjee S, Kar A, Chanda J, et al. Development of Ayurveda – tradition to trend. J Ethnopharmacol. 2017;197:10–24. https://doi.org/10.1016/j.jep.2016.09.024. Elsevier.